One of the best things about having a wedding is being able to look back on that wonderful day over the years to come. A wedding guest book is a great way of getting messages and sentiments from your loved ones and is a lovely keepsake. However a traditional wedding guest book often ends up on a shelf somewhere and is rarely looked at. Wouldn’t it be nice to have a more unique memento of your big day? Something that reflects your personalities and provides an activity for guests at the reception? If you’re keen to do something different but not feeling creative, don’t worry – we’re here to help! We’ve brought together some unique wedding guest book ideas to help you get started – choose one of these or use them as inspiration. This is a fun and modern upgrade on traditional wedding guest books. Set up a photo station with your book: give your guests a Polaroid camera or two and ask them to take photographs of themselves and stick them in using washi tape. Guests can leave notes as well, creating a cute scrapbook of your big day that will always remind you of the people who shared it with you. Think about providing some fun props for extra-entertaining photos. To create a beautiful, lasting memory of your wedding day, ask guests to sign something that you can keep in your home, like a wooden swing, a piece of furniture or even a piece of wood that could be used as the centerpiece of a table. This rustic wedding guest book idea means that those cherished memories can move with you from home to home throughout your married life. If you are both creative types and don’t mind things getting a bit messy, then why not set up an art station for your homemade wedding guest book? Have a canvas guest book that guests can sign in paint, felt-tips or crayons; encourage people to draw pictures, sketch other guests, write poems or anything else that makes your wedding memories a work of art. An alternative and fun option. A truly contemporary wedding guest book option is a video guest book for you tech-savvy couples. Give guests an iPad or video camera so they can film messages for you both; the result will be a fun and informal video compellation that you can watch again and again (and won’t take up any shelf space!). Are you and your partner music buffs? Or perhaps you’re keen musicians who met in a band? Why not choose an alternative wedding guest ‘book’ that reflects your shared interests? Ask your guests to sign vinyl records, manuscript paper or even a guitar or musical instrument (although a grand piano might be a bit ambitious!). A lovely homemade wedding guest book idea that is artistic but not as potentially messy as going all-out with paintbrushes. Ask your guests to dip their thumbs or a finger into different colour paints and add their prints to an image of your choice. The prints could be balloons helping the image float or leaves on branches of a tree – the options are endless and lots of templates can be found online. The result is a special piece of art to keep on your wall to remind you of your special day. If you are having a winter wedding then a great Christmas wedding guest book idea is to have guests sign baubles (or other ornaments) that can then be used to decorate your tree every year. This works as a practical gift and provides lasting memories. It will be so lovely to be reminded of your special day every time you look at your Christmas tree. 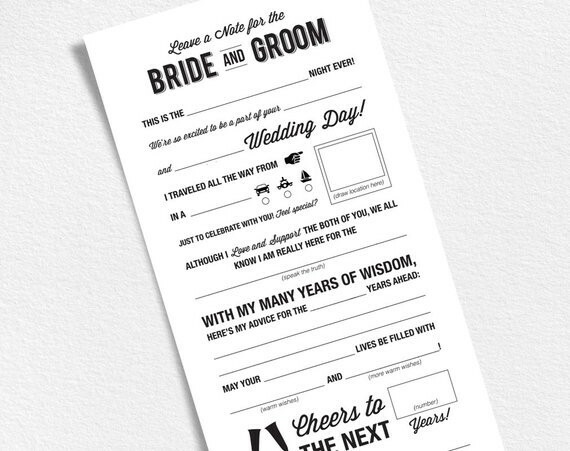 To add some more fun to your wedding, why not have ‘guest libs’ templates for your guest book? These can be downloaded free online or can be home made for a more personal touch. Friends and family can fill in the blanks to offer marriage advice as well as congratulations and maybe share a fond memory of the two of you. A sweet and low-budget alternative wedding guest book. Perfect for the world travellers among you, this non-traditional guest book idea will provide you with a memento that reflects your love of adventure. Collect vintage postcards for guests to write their messages on, or display a vintage map or globe for people to sign. Additionally, guests could write suggestions on where to visit next to ensure your married life continues full of adventures. A signing frame is another way of getting a guest book you can later display as a constant reminder of a joyful celebration. Choose a photo of the two of you with a deep mount inside the frame for guests to sign. This looks stylish at the reception and does not take up too much room, but also gives you something for your home – at a later date you could also replace the photograph with a wedding picture. - Make sure there are signs instructing guests what to do, so everyone is clear what is expected. - Assign a member of the wedding party to oversee the guest book area and encourage people to sign; otherwise you might end up with a half-finished final result. - Provide plenty of pens, markers, cameras, iPads… whatever is necessary to complete the guest book so more than one person can sign at one time. - Don’t be afraid to do something different. Take one of these unique wedding guest book ideas, or adapt them to suit your interests and wedding.